TRADITIONAL NAMES: Tītānia (MG); COMMENT: Tītānia from zizania, a Bibilical term for various weeds. KEY FEATURES: Slender herb to 1m. Stems hairy. Leaves opposite, triangular to oval, 7x4cm, hairy, toothed; stalk slender, to 3cm. Flowers long terminal cluster; sepals/calyx green; petals/corolla red, tube to 15mm, upper lip 5mm; stamens protruding. 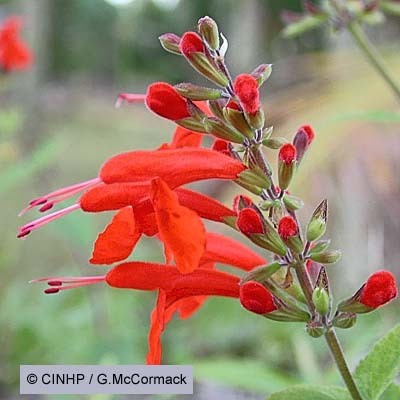 Salvia coccinea B.Juss. ex Murr. NEGATIVE SIGNIFICANCE: Weed - minor. Comments: Minor weed in waste places, sometimes very common (especially on Mangaia). 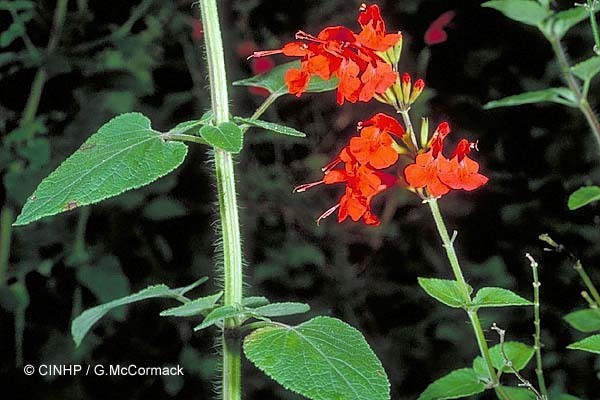 IDENTIFICATION: Annual or short-lived herb, ascending, to 1m. STEMS hairy. LEAVES opposite, triangular to oval, to 7x3cm, surfaces hairy esp. below, marginal teeth; stalk to 3cm. FLOWERS terminal long-cluster; bract green, 6mm, margin long-haired; sepals/calyx green or purple, 10mm, split 50%; petals/corolla red, tube 20mm, lips ~ 5mm; stamens protrude to 4mm. Several cvs.